I am in search of the highest mountain to summit in the most remote location. I do that because nowadays the most well-known trails are so populated so I seek out the lesser known assents to truly get the solitary outdoor experience. Also, I find summiting a collection of peaks because they are on a specific list or have prominence is quite appealing. This often results in assents off trail, route finding and dancing in unknown territory where there isn't much information out there. I remember my first summit many years ago and when I reached the top I knew then that I was going to be in search of summiting peaks. I loved the pain of getting to the top: it was hard, there were false summits and the vertical gain in a short distance was grueling without a trail! My feet hurt and every part of my body felt defeated. Yet, once I reached that summit all of that went away and it was worth every agonizing step! I knew then I must begin to tick off the summits from the Peak list I had chosen. I when I think of a successful summit it’s when I make it to the top of the Peak with everyone on the trip, and to the bottom of the mountain with everyone on the trip and no injuries. What people don't always consider is that most of the injuries are on the decent and not the ascent. I also never think of not summiting as a failure but as a learning opportunity. There have been many times when I attempted to bag a peak or climb a mountain and unforeseen circumstances have resulted in an “Attempt” rather than a Successful Summit. When you “attempt” a summit and don’t make it then the gift is to go back for another visit to the same location with a different experience. Some of the most memorable stories have come out of unsuccessful attempts such as the time when my climbing partner ran over my backpack with his car at the trail head and my crampons popped my water bladder leaving us to share his. After a lot of laughter and careful consideration of what we brought with us on the trip we decided to attempt the summit with what we had. We had a water filter and were in an area with many lakes, which we were 100% certain had water in them. However, we didn't summit the mountain that day but it wasn't because of the lack of water it was because my partner got altitude sickness and we had to descend. I'll never forget that trip! The beauty of this unsuccessful summit is that now I get to go back to this beautiful and remote area again and do another attempt. These are my essentials that I always bring with me on peaks and had become a best practice for regular hikes as well. 1. Knowing your ability, preparing and research are key! 2. Preparation also includes training at elevation and elevation gain. 3. Bring clothing for all types of weather as mountain weather can change rapidly. I never leave my sunglasses, gloves, knit hat, pants, down jacket or a rain coat at home no matter how warm the weather says it is. 4. Other key essentials: always have a headlamp, small stove, extra lighters, First aid kit, space blanket, knife, micro spikes & my Spot. 5. Bring extra food and water. 6. Know your trails and where you’re going if there isn't a trail then know what direction you need to be headed both to the summit and back to the trail head. I plan the route and keep a compass, printed map & route description handy. 7. Always evaluate the situation, prepare in advance and let someone know where you’re going and when you expect to return. 8. Understanding signs of altitude sickness and what to do about it. 9. Lastly, start early as the terrain type can slow you down. For example, 1 mile on scree or talus can take 3 hours if the vertical gain is steep. My philosophy is to only bring the essentials of what’s needed while you’re on your trek. This will of course vary based on a day summit vs an overnight summit attempt and whether your able to camp at the trail head or have to backpack in. In other words, for a backpacking trip every ounce counts! Car camping you have to be mindful of whether or not your in bear country and what you can and can't leave in your car. My experience is that this is my lifestyle where I spend all my free time hanging out in the mountains whether its rock climbing, backpacking, hiking, snowshoeing or walking I get outside no matter what the conditions are and I have a group of fellow outdoor lovers that are willing to go with me. I have also adopted a "just say yes" to outdoor adventures! Some of those have been the best experiences of dancing in the unknown resulting in growth and often times learning something new. It’s my guilty pleasure to continue to bag peaks, I have been doing it for many years now and will continue for years to come. Christa is the Ambassador for our Nevada chapter. 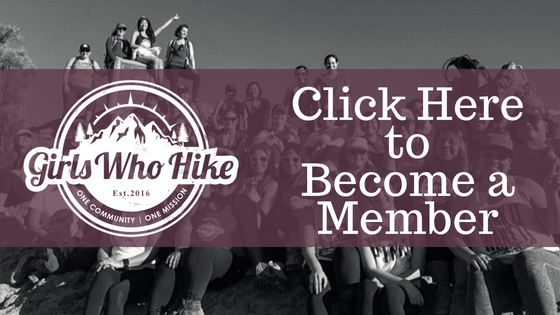 You can join her local meetups and discussions through the Nevada chapter by clicking here.